We are pleased to announce that Valley Renewables Group has now submitted a formal application to purchase 21.3 hectares of woodland (nearly 53 acres) near the Carron Dam for our community. This application has been made under “CATS”, which is Forest Enterprise Scotland’s Community Asset Transfer Scheme. If successful, 95% of the purchase price would be paid by the government’s Scottish Land Fund, with the remainder coming from windfarm community benefit funds. We have also applied for funding to employ a part time woodland manager for the first two years, to start developing the site. 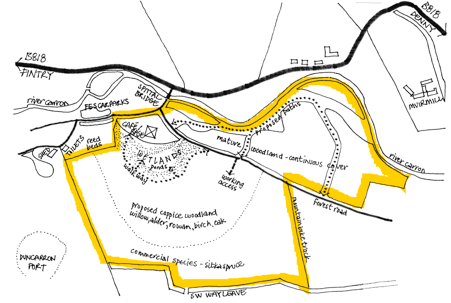 Our plan would be initially to develop the woodland as a community asset, as well as using the site for our annual open day and other events, as per the map below. Our long-term vision is to build a permanent “Community Base” and cafe on site, which will become a focus for our community. The Community Council and VRG board both voted unanimously in favour of this project, and now we need your backing too! The application has now entered a statutory consultation period and it would really help our case if you would be willing to write in and show your support for the project. Full details of the application and consultation can be found at http://scotland.forestry.gov.uk/managing/get-involved/community-asset-transfer-scheme/carron-valley, and responses must be received in writing before the consultation closes on 23rd January 2018. Our community currently has no social infrastructure – no school, church, hall, shop, pub or meeting place. The purchase of this woodland site is a great opportunity to progressively create a community facility for all. The Community Woodland will be a welcoming and accessible space for local people and visitors to meet, find information, get involved in community activities. It will be a catalyst for new groups and events giving the community the opportunity for more cohesion and resilience into the future. The size and location of the site gives us the opportunity for a phased development to meet the needs of our community, starting simply with management of the woodland, then developing a site for our community open day and other events. When we are ready we will develop the community base and drop-in cafe. A working group of VRG and Community Council members is in place to manage the application process and eventual site development. Even though the application has now been submitted, this is really just the beginning, so we encourage all interested community members to contribute by joining this group. If you have any questions regarding the application, or would like to volunteer on the working group please contact our secretary, Barbara Wilson (email bwilsonscotland@yahoo.com, or 01324 822 717, evenings only) and we will reply as soon as possible.